I have written many times about the deep corruption among the political class. The way they have always taken bribes is through their families. I have written how Hillary’s brother magically got the gold mining contract from Hati when he wasn’t a gold miner. The Clinton Foundation which was supposed to be a real charity shut down after she lost the elections as all the foreign government withdrew because they were simply bribing Hillary to get influence. Obama back in 2013 was forced to sign the Stop Trading on Congressional Knowledge Act into law at a celebratory ceremony attended by a bipartisan cast of lawmakers. That was exposed in 2011 on CBS 60 Minutes News Program. Then CNN ran a story on this loophole in 2012, and suddenly there was an Act in 2013. Now the author of Clinton Cash has come out with a new book exposing all the shenanigans going on in Washington. I previously wrote: The collapse in the rule of law is so vital for sustaining the economy that it is often overlooked. This latest book covers BOTH Republicans and Democrats. 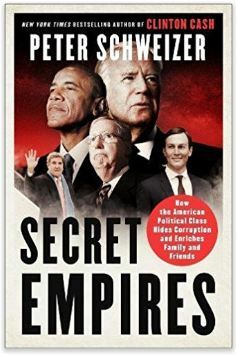 In the Secret Empires, Peter Schweizer exposes Joe Biden and John Kerry have been the cornerstone of Democrats in the Washington establishment for more than 30 years. The sons of Kerry and Biden formed an investment fund dealing with countries overseas with whom the US was negotiating contracts. This is where Hillary was doing the same thing – selling influence via the Clinton Foundation. Simply put – career politicians have to come to an end. When I was managing money, I was not allowed to have a personal account and NEITHER were my children or my mother. I could never be charged with insider trading because there simply was no possible way anyone in my family could benefit indirectly. The same standards just DO NOT apply to politicians. I have stated plenty of times, the Democrats preach hating the rich while they load the trunks of their family’s car with all the loot. Then they carve out loopholes for the rich when they pay into their reelection coffers. The corruption is way beyond anything you might imagine. « Do We really Hold: In God We Trust?